RAJAA MEKOUAR-SCHNEIDER, LPEA BOARD MEMBER, SENIOR INVESTMENT TEAM MEMBER AND HEAD OF PARTNERSHIPS & SYNDICATION AT PE FIRM KHARIS CAPITAL, SAYS THE INDUSTRY NEEDS TO COMMUNICATE MORE AND BETTER THE ROLE IT PLAYS IN GENERATING ECONOMIC GROWTH, THROUGH INNOVATION AND PRODUCTIVITY IMPROVEMENTS. ONE OF THE GOOD LONG TERM EFFECTS OF PE INVESTING (AND MOSTLY FROM GROWTH EQUITY INVESTORS) IS JOB CREATING AND THEREFORE POSITIVE SOCIAL IMPACT. What is private equity‘s contribution to the broader economy? Private equity is no longer a cottage industry, but rather an integral part of the mainstream economy – an industry representing $4 trillion in assets and employing millions; It also accounts for more than a quarter of all European mergers & acquisitions activity. Its role is therefore crucial in terms of growth generation and directly impacts both GDP and other economic key measures like employment. Recent EU-sponsored studies have found that economies with growing numbers of PE-backed companies have a negative correlation with unemployment rates, and that during the 2007-2011 crisis, PE-backed firms continued to increase headcount while jobs disappeared elsewhere. Those firms perform nearly 7% better than other companies by boosting productivity, and are disproportionately innovative, with PE representing 12% of Europe’s patent applications. These benefits reflect the ability of private equity to focus attention and effort on a limited number of portfolio companies, apply sector expertise, thus maximising value creation for stakeholders over the long run. In an era where bank funding for companies, especially SMEs, has dramatically declined, private equity funding is more important than ever in providing sustainable support to growth. Banks, years ago, had de facto an active social role in the economy. Not anymore. PE and investors in general are taking the lead, from the productivity angle, which can be painful in the short term, but is building a unique engine for growth over the long term. How can the sector make itself better understood? Private equity is widely misunderstood by the public at large, and often by politicians, because it has only recently been on the media radar which have an unfortunate tendency to focus on the largest mega Leveraged BuyOut deals, especially when the investment meets a stumbling block. While PE is often classified as an alternative investment alongside hedge funds, it actually is about real people, real industries and real companies. It has always existed as private families and investors have traditionally invested in companies to make them grow and thrive. But it is widely agreed that its modern premises started with the Rockefellers and the Gettys in the late 1800s. Nowadays it is Pension Funds who make up the largest share of PE funding. Having said that, its perceived complexity comes from the fact that it encompasses a wide variety of strategies and relies on sometimes complicated funding and legal structures. It also used to be secretive but this is changing. 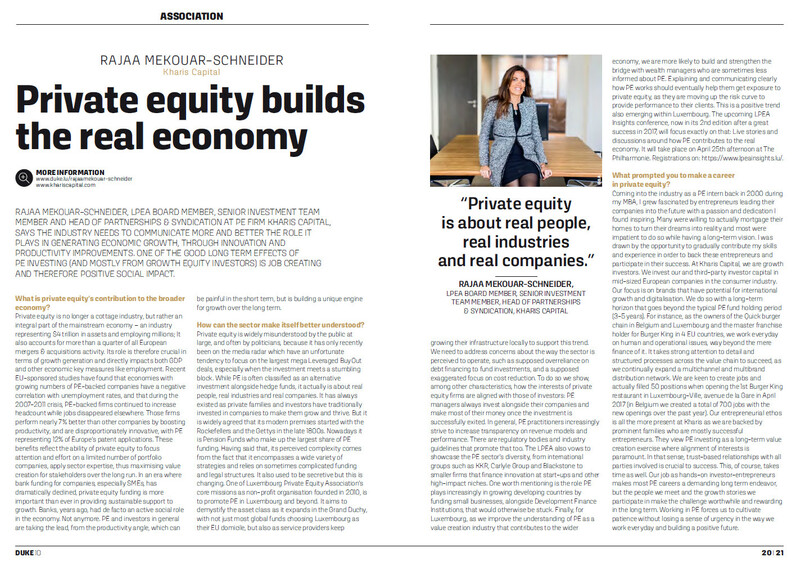 One of Luxembourg Private Equity Association’s core missions as non-profit organisation founded in 2010, is to promote PE in Luxembourg and beyond. It aims to demystify the asset class as it expands in the Grand Duchy, with not just most global funds choosing Luxembourg as their EU domicile, but also as service providers keep growing their infrastructure locally to support this trend. We need to address concerns about the way the sector is perceived to operate, such as supposed overreliance on debt financing to fund investments, and a supposed exaggerated focus on cost reduction. To do so we show, among other characteristics, how the interests of private equity firms are aligned with those of investors: PE managers always invest alongside their companies and make most of their money once the investment is successfully exited. In general, PE practitioners increasingly strive to increase transparency on revenue models and performance. There are regulatory bodies and industry guidelines that promote that too. The LPEA also vows to showcase the PE sector’s diversity, from international groups such as KKR, Carlyle Group and Blackstone to smaller firms that finance innovation at start-ups and other high-impact niches. One worth mentioning is the role PE plays increasingly in growing developing countries by funding small businesses, alongside Development Finance Institutions, that would otherwise be stuck. Finally, for Luxembourg, as we improve the understanding of PE as a value creation industry that contributes to the wider economy, we are more likely to build and strengthen the bridge with wealth managers who are sometimes less informed about PE. Explaining and communicating clearly how PE works should eventually help them get exposure to private equity, as they are moving up the risk curve to provide performance to their clients. This is a positive trend also emerging within Luxembourg. The upcoming LPEA Insights conference (April 25th afternoon; Philharmonie Luxembourg), now in its 2nd edition after a great success in 2017, will focus exactly on that: live stories and discussions around how PE contributes to the real economy. What prompted you to make a career in private equity? Coming into the industry as a PE intern back in 2000 during my MBA, I grew fascinated by entrepreneurs leading their companies into the future with a passion and dedication I found inspiring. Many were willing to actually mortgage their homes to turn their dreams into reality and most were impatient to do so while having a long-term vision. I was drawn by the opportunity to gradually contribute my skills and experience in order to back these entrepreneurs and participate in their success. At Kharis Capital, we are growth investors. We invest our and third-party investor capital in mid-sized European companies in the consumer industry. Our focus is on brands that have potential for international growth and digitalisation. We do so with a long-term horizon that goes beyond the typical PE fund holding period (3-5 years). For instance, as the owners of the Quick burger chain in Belgium and Luxembourg and the master franchise holder for Burger King in 4 EU countries, we work everyday on human and operational issues, way beyond the mere finance of it. It takes strong attention to detail and structured processes across the value chain to succeed, as we continually expand a multichannel and multibrand distribution network. We are keen to create jobs and actually filled 50 positions when opening the 1st Burger King restaurant in Luxembourg-Ville, avenue de la Gare in April 2017 (in Belgium we created a total of 700 jobs with the new openings over the past year). Our entrepreneurial ethos is all the more present at Kharis as we are backed by prominent families who are mostly successful entrepreneurs. They view PE investing as a long-term value creation exercise where alignment of interests is paramount. In that sense, trust-based relationships with all parties involved is crucial to success. This, of course, takes time as well. Our job as hands-on investor-entrepreneurs makes most PE careers a demanding long term endeavor, but the people we meet and the growth stories we participate in make the challenge worthwhile and rewarding in the long term. Working in PE forces us to cultivate patience without losing a sense of urgency in the way we work everyday and building a positive future.